Thomas Tuchel had every reason to be bitter, but it was hard to argue with his assessment: VAR has a handball problem. 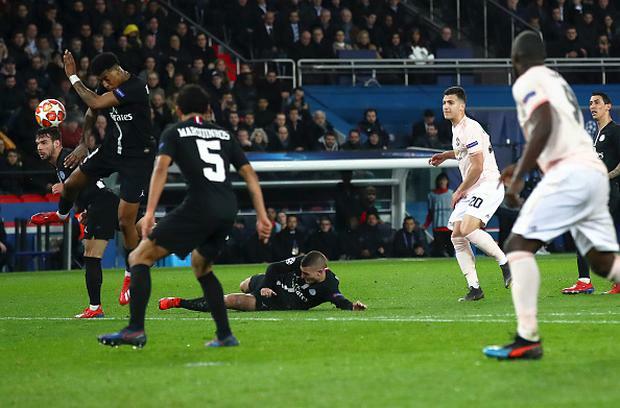 The decision to penalise Presnel Kimpembe on Wednesday night was the latest example of a referee convincing himself, after watching enough slow motion replays, that deliberate handball had been committed. Even when in real time it was far from obvious. "I am a big supporter of VAR, and I still a big supporter of VAR," Tuchel insisted at his post-match press conference at Parc des Princes. "But with handball, it is a super-difficult thing. Because there are too many points in do we punish it or not punish it: distance, natural position, so many things to discuss. This is the problem with handball…There are reasons he can give the decision. It is always 'soft facts' with hands." That is precisely the issue with handball decisions on VAR. This was introduced to provide extra evidence to overturn "clear and obvious errors" in "match-changing situations". The idea was that the VAR replays would be easy to judge, because they would only be used to establish the facts in a narrow set of circumstances. The evidence would be clear and the judgements would be objective. But it has not worked out like that. When it comes to handball decisions, incidents are being re-refereed under the intense scrutiny of VAR. And it feels as if rather than the details simply being established, as VAR intended, they are instead being subjected to a different standard of what ‘deliberate handball’ actually means. Deliberate handball has always stood out among the laws of football, the one area where subjective interpretation is required. That has never been satisfactory, and that is why IFAB are currently looking to change the laws in future. They want to remove the references to intent for attacking players, to mean that a goal scored accidentally by a handball would be disallowed. That could help to move handball from subjective to objective criteria, and when IFAB head David Elleray spoke recently about introducing references to a player’s "natural silhouette" to determine the offence, it felt like the start of a new definition. But for now deliberate handball is still a grey area, subject to interpretation. Or what Tuchel called the "soft facts". And UEFA even knew this would be a problem when they decided that VAR would oversee handball decisions in the Champions League this season. UEFA chief refereeing official Roberto Rosetti tried to set the standard when he discussed the issue in January. He said that VAR must intervene when there is "clear evidence of a deliberate act of a player making contact with the ball with the hand or arm". Of course a "deliberate act" is open to interpretation, and Rosetti did separately clarify that the key to making the call would be the position of the defender’s arm. "It is not easy to see [if it is deliberate] because I can’t say I have ever seen a defender deliberately doing a handball," Rosetti said. "The big challenge is the position of the arm. When the arm is totally out of the body above the shoulder it should be penalised. If the defender is making the body bigger in order to block the ball it is not fair." This is an objective standard, and if it was followed by all referees and VAR officials then it would mark an improvement on the current situation. Because the evidence of the last few weeks is that too many situations where a shot hits a player’s arm in the box is given as a penalty, completely out of kilter with fans' and players’ understanding of the game. Even if the arm is not "totally out of the body above the shoulder". Or when the defender is not "making the body bigger", as per Rosetti's own criteria. The Kimpembe handball was only the most recent example of this. Two weeks ago Nicolas Otamendi was penalised, again by VAR, turning away from a shot in the box when Manchester City travelled to Schalke. It is an increasingly common situation in Italy too. Just last week Juventus' Alex Sandro gave away a VAR penalty when Napoli’s Fabian Ruiz volleyed the ball into him when Sandro had his back turned. No one thought it was a penalty, except for the VAR officials. Perhaps the first incident of this was at the World Cup final last June when the ball hit Ivan Perisic's hand in the box, the type of incident that routinely happens in games but comes to nothing. But the referee went to re-examine it and after repeat viewings he convinced himself there was a foul. Even though, again, it did not feel like an offence in real time. France scored the penalty and went 2-1 up. Clearly when so many referees make the same mistake, the fault can no longer belong to them as individuals. But when referees are being even harsher than the UEFA guidance, that suggests it is not even an issue of technical wording. But a problem with the technology itself. Even though the VAR guidelines say that slow-motion should only be used to determine contact with the arm, with full-speed replays to determine intent. Football is a fast-moving fluid game, combative and physically draining. In the frantic rush of a busy penalty area, sometimes the ball will hit an arm, hand or elbow, even when no-one intended it to. But when that particular collision is isolated, taken out of its context, slowed down and replayed over and over and over again, it will look different. As if the arm’s position was unnatural on purpose. As if the handball was deliberate all along. There is now an inevitability now when referees consult the VAR screen, because the contact is so obvious, even if the intent is not. For as long as these handball decisions are pored over frame by frame, they will always look more intentional than they do in the normal flow of things. They will continue to distort the game, away from the expectations of fans, away from the practices of defending, because they have not woken up to the fact that fast action looks different slowed down. If governing bodies cannot adjust to that, and apply a fairer standard to defenders, then VAR will continue to award these penalties that feel so out of place. Was the referee right to award Manchester United's crucial penalty against PSG?